The Hub and Catalog Have a New Look! Communications and CAIT have teamed up over the 2016 spring break to launch a new look for both the Hub and Catalog! This is a quick rundown of the most important changes and where you can find what you're looking for. The new look for the Hub is easier to read and is able to present more information more effectively (like the Announcements). One of the biggest and best changes, however, is a new responsive design that is significantly more usable on mobile devices like phones and tablets. 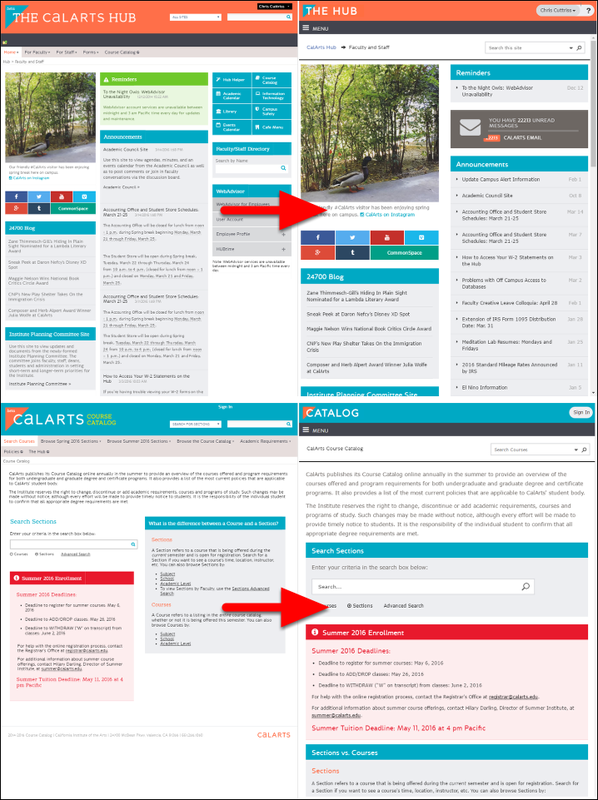 Over the past few years we have seen a huge increase in the number of people accessing these sites on the go, and it was a difficult experience to say the least. We're looking forward to hearing how this new design works for you! Here is the old version of the Hub and Catalog on the left and their new looks on the right, as seen on an iPhone 6 Plus (or device of equivalent size). And here they are on an iPad. A new design is only great if it delivers the information you need in a better way. The redesigned menu system does just that! 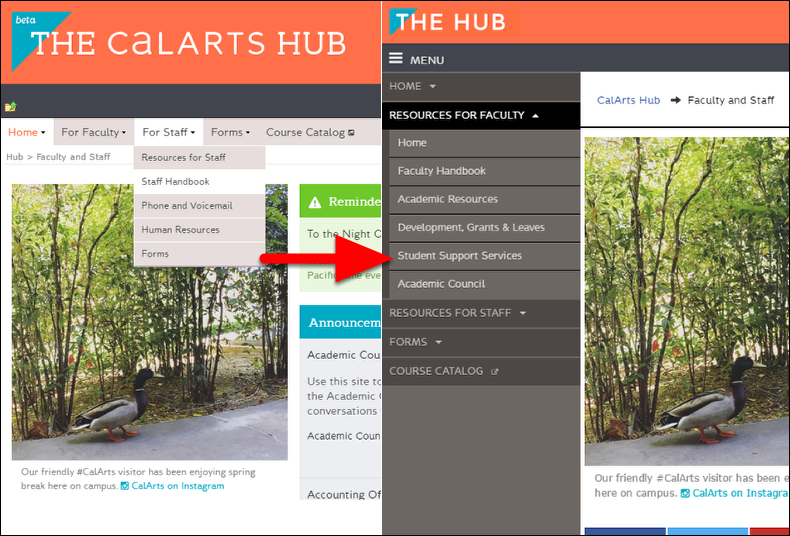 In the old Hub the menus were displayed horizontally, above the Reminders and the CalArts Instagram photo. Showing the menus this way is just fine if there are only a couple of options, but as the Hub grows and more content is available the menu starts to be cluttered and more difficult to comprehend. The new menus slide-in from the left when you click on the Menu button on the Hub home page. This style is more intuitive and is significantly more flexible as more content is added. The new menu system is especially helpful with the new Catalog. The old site ran out of space almost immediately, which made it more difficult to find what you needed or add any new features or content. The old menus were so big we have to make our demonstration images horizontal just to fit everything! 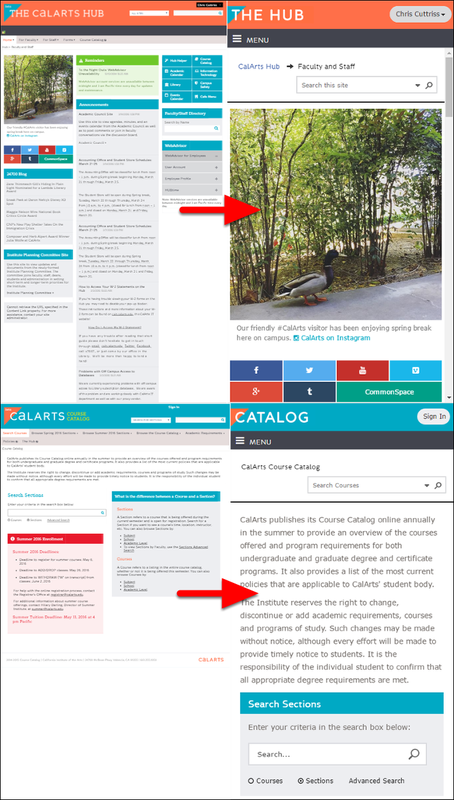 The Communications team and CAIT have started moving more content from CalArts.edu and other sites to the Hub. 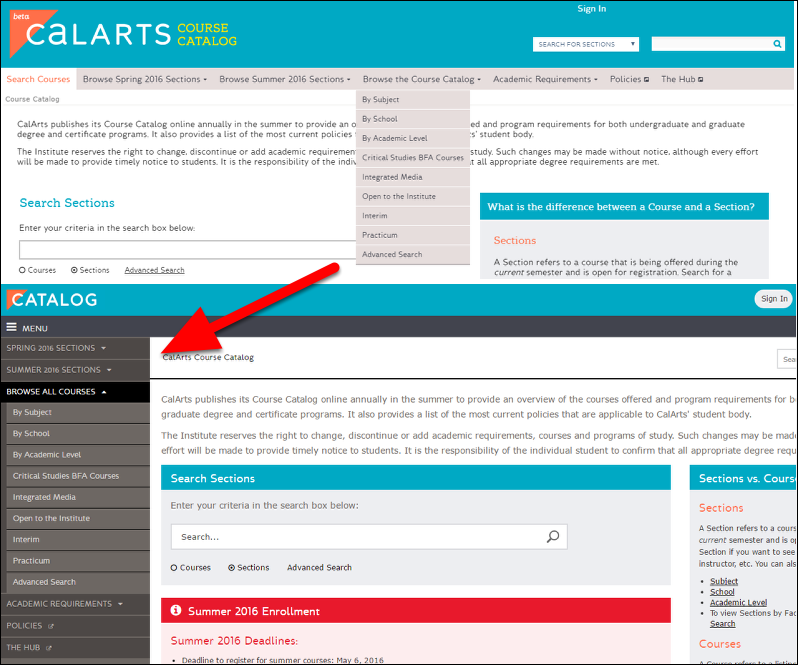 Look for even more content in the future as the Hub becomes a more robust tool for Students, Faculty, and Staff alike! Thank you for the continued improvements and thoughtful presentation.